All her life, Gracyn Pierce believed in what she can see and touch. But after learning she is part of a supernatural world, she knows things are about to change. 5.0 out of 5 starsI can't get enough! As a follower of Tonya Royston since her very first book, you’d think at some point I’d come across something that I don’t much care for. But that isn’t the case with this second installment of the Gypsy Magic series. In fact, my opinion still stands that the books just keep getting better and better. This one is filled with lots of build-up and possible foreshadowing of what is yet to come, and I have no doubts that things are going to get INSANE in the next book. In a good way, of course. As Gracyn begins to learn more about her magic, she also begins to learn that there are secrets being kept from her – some revealed, but most still yet to be revealed. Despite warnings to stay away from him, she gets closer to Lucian and learns that he’s not nearly as bad as everyone thinks he is. It’s pretty hard not to like Lucian at this point in the story. But not there are lots of creepy things going on and an evil witch might be on the lose. To put it mildly, this book is filled with lots and lots of stuff going on. But it’s all written smoothly and the pieces fit together in a nice way that makes it easy to follow. And you can kind of get an idea of what to expect next, but it’s still a bit vague as to not be totally predictable. In other words, it’s an amazingly well-written book that gives readers just the right amount of information to make them want to come back for more. And trust me, I will definitely be back for more. I can’t wait! 5.0 out of 5 starsAnother wonderful read! Ms. Royston has done it again! 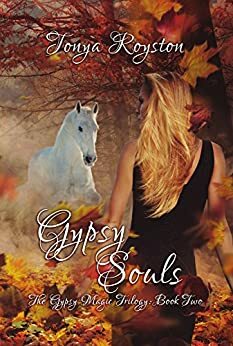 In book 2 of this saga, I love how the bond between Gracyn and her horse deepens and I enjoyed finding out about the complex triangle she has forming with Alex and Lucian. The unexpected twist has me anxious to move on to book 3. Can't wait! 30 pages left to read and I feel like I am living alongside these characters. I feel invested in this story. Book 3 arrived today so that one this book is done I can continue with the story. Real easy read. I have enjoyed all of Tonya Royston's books.